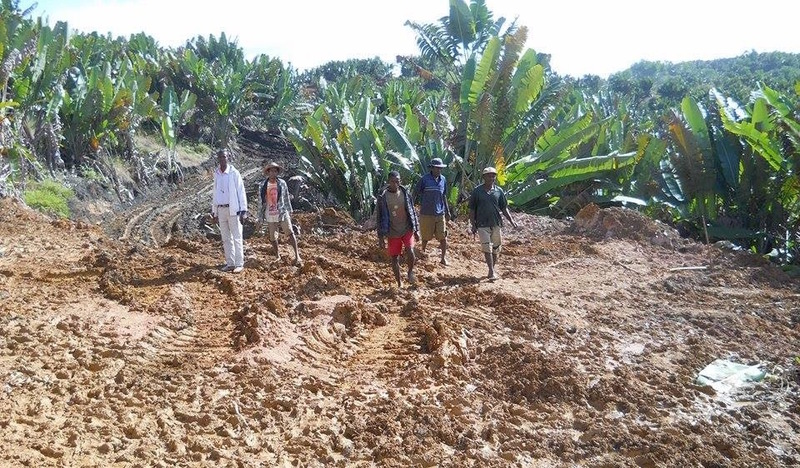 (Ottawa) Farmers from Vohitsara in eastern Madagascar are demanding that DNI Metals Inc. cease operations on their land and compensate them for damage to their lands, crops, trees, and fish ponds that the company has acknowledged destroying without their consent and fair compensation. Malagasy civil society organisations and media reports have confirmed that DNI Metals has undertaken drilling and trenching on the villagers’ land – in some cases without their agreement, while other farmers have signed agreements that provide vague and inadequate commitments from the company and do not meet basic standards of fairness. The company had begun to undertake an inventory of damages jointly with Vohitsara villagers in July, but it was never completed. The company had previously done its own inventory, without the presence of the landowners or independent observers. Villagers have also reported having been intimidated and harassed by DNI employees and by government officials when they sought to stop the unauthorized operations and to get fair compensation for damages they have suffered. On September 7, 2017, three villagers who had denounced DNI Metals’ activities and refused to sign agreements with the company were placed under house arrest by police (gendarmes), only to be released without charges on September 10. “We are very concerned by these arrests, as well as reports that gendarmes are preventing local people from entering their own farms, where DNI Metals is actively working without permission,” said MiningWatch Canada spokesperson Jamie Kneen. DNI Metals denies all of the alleged abuses and irregularities, and maintains that it has been exemplary in its corporate social responsibility (CSR) efforts. Malagasy media have also reported that despite the company’s claims to have an exploitation permit, the Malagasy Ministry of Mines and Petroleum has confirmed that it only has an exploration permit. At the same time, Malagasy organisations, including Solidarité des Intervenants sur le Foncier/Sehatra lombonana ho an’ny Fananantany (SIF), report that the National Office of Environment has denied issuing an environmental authorisation for DNI Metals. Meanwhile, local people say they were not consulted regarding environmental and social impacts prior to the initiation of exploration activities. While there are no legal requirements for Canadian corporations’ international operations under Canadian law, other than the Corruption of Foreign Public Officials Act, Canada is party to a number of international instruments and conventions in respect of business and human rights, including the UN Declaration on the Rights of Indigenous Peoples and the standard of Free, Prior, Informed Consent.